There’s just nothing like Fabulite (strontium titanate) for a wild show. Every light makes this thing dance and spew rainbows of dispersion fire in my Mini-12 design. 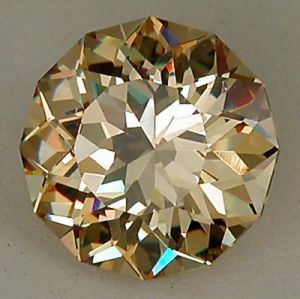 This synthetic was sold widely during the 50’s under the name “Fabulite” as a diamond simulant. Optically, it’s great – with an identical refractive index and an even higher dispersion than diamond. However, it is soft at a hardness of only 5. This very large stone is suitable for an unbelieveable pendant – Your friends will demand to know where you got it!